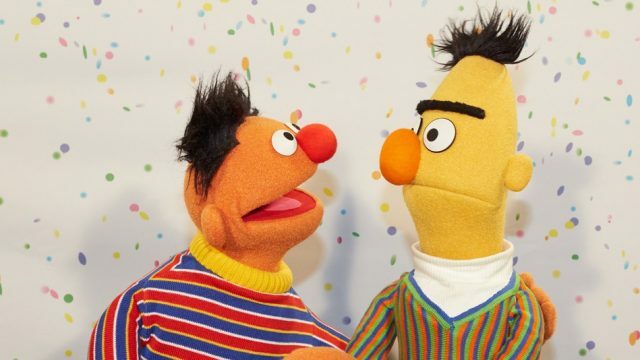 The question of Bert and Ernie’s sexuality is afoot, with the writer of the two claiming that they are a couple, and the institution that he worked for claiming that they’re absolutely not. I remember one time that a column from The San Francisco Chronicle, a preschooler in the city turned to mom and asked “are Bert & Ernie lovers?” And that, coming from a preschooler was fun. And that got passed around, and everyone had their chuckle and went back to it. And I always felt that without a huge agenda, when I was writing Bert & Ernie, they were. I didn’t have any other way to contextualise them. I mean, logically, that makes no sense, as that very same universe gave us the definition of Amor Fou/abuse relationships in Kermit and Miss Piggy. Sure, they weren’t suited, but it was very much certainly love, or at least lust. They were romantically involved, even if Kermie was periodically cuckolded by Pierce Brosnan. So, by ignoring the actual motive by the writer, it removes any meaning we got from it. In a hetero-normative-amphibian-swine sense, and slapping Sesame’s logic over the top of it (in that sexuality or romantic relationships do not exist), we all lose what we gained, and we endured the brutality of their divorce for nothing. It’s nonsense. Let’s not forget, Sesame Workshop has always been rather open with relationships. A clueless eight-foot bird is the vessel of education, Big Bird is clearly us. It’s how we learned. But in taking this stand, they’re losing a chance to do what they’ve always excelled at doing. We’re bearing witness to a revision of long-standing fictional characters. Oddly, we’re seemingly doing it backwards. JK Rowling recently outed Albus Dumbledore, despite a complete lack of evidence in the narrative. Conversely, Bert and Ernie were written as gay, but the official stance is that they’re not. If a character is gay, write them as gay. If they’re written as gay, accept them as gay. Simples. What’s the problem if they are? In my mind, Bert and Ernie are the only example of a stable relationship in my life. They’ve been together for as long as I can remember, and they remain together, faults and all. It’s a love so obvious that even Linda can hear it. If a pig can love a frog, and if it feels real, it’s real. Why not the guys with the Rubber Duckie?